Children's pre-literacy is about learning to read. Most children are born with an innate ability to learn to speak. But unlike learning to speak, children do not come out of the womb ready to learn to read. They will need your help to teach them about letters, words and books. Not only will your child's speech-language skills impact his ability to read, but his pre-literacy skills will bear heavily on his reading success. So what exactly are pre-literacy skills? And what can you do to safeguard his reading-readiness by the time he enters kindergarten? Learning to read is a process beginning with emergent literacy, leading to early literacy, and culminates in conventional literacy. A child in the emergent phase (pre-literacy) is learning about print and sound. In the early literacy phase he is learning about decoding (word recognition). To decode a printed word, a child uses what he knows about letter-sound relationships to sound out a word (read a word) to gain meaning. A child in the conventional literacy stage is reading and writing for meaning. Strong emergent literacy skills are a very good predictor of reading success. Children need to be taught pre-literacy skills... so your child will need your help to teach him these things. Because no home environments are the same, children learn emergent literacy skills at different times in their early years and at different rates depending on what they are exposed to. A child in a print-rich home (a lot of reading material available) will have more opportunity to learn these skills than a child whose home has limited reading material. The emergent literacy phase lasts about five years (birth to the beginning of kindergarten) for a child raised in a home with lots of printed matter. Create situations and take advantage of opportunities to teach these emergent literacy skills not only in play situations but throughout your day. Talk about pictures, letters, sounds, words, symbols, signs and books. Teaching does not always mean sitting at a table instructing with paper, pencil and books in hand! Teaching and learning can be fun and rewarding for both you and your child. Teach more than one emergent skill at the same time. In the following examples you will see that several pre-reading skills are addressed. Oral language encompasses well developed receptive and expressive language skills. A child who easily learns new vocabulary, uses correct grammar, has solid narrative (recounting events, telling stories) and discourse skills will more readily learn to read. Provide as much opportunity as possible for your child to learn to talk. Take advantage of the section How To Talk to Your Baby, which provides more detail and suggests activities for speech-language development. A child who can name upper and lower case letters of the alphabet and identify the corresponding printed symbol has alphabet (letter) knowledge. By kindergarten children are expected to recognize and name both upper and lower case letters. Mom: Here's the S. It says /sssss/. And look... it looks like a snake. S snake says /sssss/. Mom: The S says /s/. Now you have the M.
Mom: That's the W. Look, turn it upside-down. Now it's the M, /mm/ like in Mommy. /mmmmmmmmm/ (and kisses the child). Mom: That letter is a D. It says /d/. (Sings a little tune /d d d d d d/ to Twinkle Twinkle.) Good! You found it. Listen to this sound /ffff/. It's the F, the letter F says /f/. A child who has an understanding of the system of letters, words, sentences and books has print knowledge. It includes knowing that pictures and words are different, printed words have meaning, and words are seen in a variety of contexts (signs, books, newspapers, computers, lists, mail, logos). It also encompasses knowing how to hold and open a book, identifying the front from the back of a book, how to turn the pages, that reading occurs from left to write, that symbols other than letters, like punctuation, carry meaning, and the rules of print. Young children will pay attention to pictures rather than words in books. An interest in print will develop over time, with exposure to and discussions about letters and words. Your child may begin to notice familiar letters, like the letters in his name, he'll comment on words he sees frequently, and he might ask about symbols (letters, words, logos and signs) that are unfamiliar. Talk about what he is noticing. Comment on letters you see in your neighbourhood when driving around, comment on the signs on the highway, let him hear and see you read your grocery list, show him the numbers on the department store receipt. Eventually he'll gain an understanding that printed symbols have meaning. Follow your finger or guide your child's finger across the lines in the book during story time. He'll learn that you read from left to write, top to bottom, and how to move from the end of one line to the beginning of the next. In addition to learning that print carries meaning, he'll become aware that spoken words are represented with printed symbols, that letters and strings of letters can be written out for language. He'll see that words look different and that they can be grouped together. He'll notice sentences and paragraphs. Your child may even begin to memorize the words and story-lines in the books you are reading to him. A child who pretends to read in this way is picking up on how text is organized and how it operates. Phonological awareness has to do with a child's sensitivity to the spoken sound of the language. A child who can think about the sounds in a word, and identify, make judgments and manipulate spoken sounds is using his phonological awareness skills. These skills develop gradually along the same path for most children. When a child learns about rhyming, he's learning to concentrate on the sounds in words and not its meaning. He'll then learn about words in sentences. His phonological awareness skills will develop further allowing him to break words down into syllables, and syllables into sounds. He'll learn more about speech sounds (phonemes) as phonemic awareness develops. When a child matches a speech sound to its appropriate letter, he is using phonological awareness skills. Phonemic awareness, part of phonological awareness, has to do with a child's auditory perception of speech sounds (phonemes) and the ability to manipulate these individual sounds. The word catch has five letters but three phonemes: / k æ tʃ / and the word box has three letters but four phonemes /b o k s /. Phonemic awareness includes many skills. Emergent writing is a child's first efforts at creating and using print in a meaningful way. A child who scribbles and draws, copies and prints letters and invents spelling is in an emergent writing stage. The primary focus in these early years is to encourage your child to become familiar with using crayons, pens, pencils and paper, and to teach him that there is a purpose to writing. 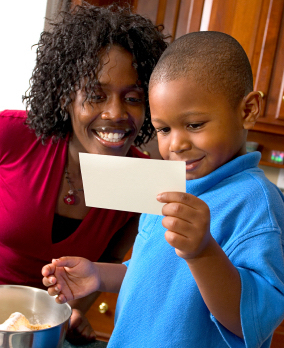 Allow your child to dictate letters and stories to you. Encourage him to write notes to grandparents and encourage grandparents to send him emails and even better, letters and cards in the snail mail. Let him help you with the grocery list. Let him write with a bar of soap on the bathroom mirror. Interpret as best you can his scribbles that look like writing, pretend you can read them. In the US all children should read well by the fourth grade, but approximately 1/3 of all fourth graders do not have these basic skills. There's a strong probability that a poor reader in the first grade will continue to struggle in the fourth. Poor readers in the fourth grade have a high probability of having reading difficulties later on. Strong pre-literacy skills reduce the chances of reading difficulties. Armed with knowledge about emergent literacy you can become your child's literacy coach! Teach these emergent literacy skills to him. Set an example and model reading. Encourage reading in your home. Make sure there is ample print material that your child can easily reach and get into. Jump on the opportunity to interact with your child when he shows an interest in any type of print. Encourage conversations that reach beyond what is written on the page. And start reading to your child even before he begins to talk; it's never too soon. Are you worried that your child is not picking up some of these emergent literacy skills? Or are you just not sure how to teach them? How do you modify teaching each of these skills based on your child's developmental level? If these are some of your concerns, a consultation with one of our certified speech language pathologists can discern whether your child may indeed have a problem or whether it's simply some guidance you may need in teaching these skills to your child. Please feel free to Contact Us - Let's Talk about your specific questions and concerns.